The original 2014 Halo pendant photographed in our studio. This light was designed by Karice in collaboration with Matthew McCormick Studios. Lighting is a major component of any functional office space. A properly lit work environment offers up a host of benefits, from reducing eye strain and improving employee wellbeing to boosting productivity and lowering energy consumption. But with so many options to choose from, finding the best lighting solution for your office can be tricky. To help cut through the confusion, our Canadian lighting manufacturers have put together some handy tips on how to bring the best lighting into your workplace. Ambient lighting is key for adding warmth and style to your office. Whether you have lamps, installed fixtures, or recessed lighting, you’ll want to make sure the light is just the right amount. Too much or too little light will not only cause headaches but also result in eye strain. Track lighting is booming in popularity these days—and for a host of illuminating reasons. Upping the design flair to offices everywhere, track lighting has a ton going for it. For instance, they come in a wide range of styles, provide versatility in use, work as task lighting, save space, and are easy to install and configure. Perfect for creating an inclusive work environment, lamps provide an intimate gathering place for meetings or social opportunities. If you are looking for a way to boost concentration and team build, lamps make great, warm-glow lighting options for your workspace. Overhead fluorescent lighting can cause a wide range of health issues, from hyperactivity to sleeping problems. Task lighting, however, shines directed light on your work, keeping the glare away from your eyes. To ensure your employees are happy and healthy, switch to task lighting with low-glare bulbs. Going with dimmable lighting allows you to control how little or how much light you need at any given time. Regulating the amount of light will also translate into lower energy consumption—and that’s good news for your operating expenses and your wallet. For more savings, consider installing timers or sensors in your workplace. Whatever project you’ve got on the go, if you want to make the most of your office lighting, consult with the experts. Quality Canadian lighting manufacturers will design and produce beautiful custom pieces to meet all your workplace lighting needs. Proper lighting is crucial for any office. Making the right choices and having a clear plan in place will help you create the ideal lighting solution for you, your staff, and your clients. For quality crafters of custom lighting, contact Karice today! Harvest Haus displays Karice’s Hollow Tree with Retta lights at Vancouver’s largest Volksfest. From October 5 through 14, 2017, Karice’s hollow tree was on prominent display at Vancouver’s largest Volkfest, Harvest Haus. A replica of Stanley Park’s famous 700-year-old tree, this installation was perfect for the first-century folklore celebration. The result of a collaboration between Maurice L. Dery and Stepan Vanicek, this unique masterpiece is made from literally thousands of lineal feet of weld. Flat strips of aluminum were cut on our OMAX waterjet machining center and then bent and tacked together in ways that seemed impossible. Measuring 8 feet by 12 feet and 16 feet high (not including the tree branches), the hollow tree took months to build and at times Maurice wondered if he was asking too much of the aluminum. “Metal just isn’t supposed to do this!” he would say. In the end, each mating strip matched perfectly and the fabricated creation was identical to the 3D model. First exhibited at the IDS Vancouver 2016 show, the hollow tree consists of two halves so it can be transported. In order to install and assemble the tree we had to design and fabricate a separate aluminum tubular substructure. It attaches to the tree with wheels, is hinged at the top – equipped with cables and a winch – and brings the two halves of the tree together. Watch this VIDEO HERE to see the stunning installation in action. Exhibited outdoors in the evening at Harvest Haus, we made a roof for the hollow tree to make it waterproof and suspended three Retta lights inside for illumination. It was staged as a bar for the event and the hollow tree display added delight and intrigue to the massive Halle. Beer is a central focus of Harvest Haus and this year’s festival featured 23 varieties including German, European, and local craft beer. There were also selections of cider, wine, and spirits. And what would Harvest Haus be without authentic Bavarian food vendors? The two-week festival opened in Bavarian style, honouring the traditions of the Harvest and combined authentic European traditions with modern fare. The festival offered seven sittings—everything from The Stein Games (beer sports competition including Stein Pong) and Lippensynchron Battle (singing competition) to The Duelling Arts (swordplay and competitive axe throwing) and Zany Mode (costume party). Although there’s no formal dress code, festival attendees were encouraged to don lederhosen or dirndl and drink out of steins. Thank you to Harvest Haus and The Social Concierge for displaying our hollow tree. We sure had fun at your event! Our Hollow Tree demonstrates our custom metal and lighting design expertise. Stunning artistry. Sophisticated design. Seamless process. That’s the Karice way, and what we’ve experienced with all our clients. For more information about us or to see how we may collaborate with you or build custom lighting works for you, contact us by sending us an email or calling us at 604-542-7137. New Vintage Custom LED lighting design – Vintage and modern team up to create the new lighting installation at the Romer’s Burger Bar in Port Moody. Four brand new lighting concepts were brought to life by the team at Karice. The end result was stunning, adding to the warmth and glow of this new dining location on Morrissey road. Our ROMERS project page shows more pictures of these custom lights made for this location. CUSTOM LIGHTING for Romer’s Burger Bar in Port Moody – Karice and CLO Design collaborate. Robert Clark of CLO Design in Seattle contacted Karice when trying to source lighting for the new ROMERS Burger Bar in Port Moody. The lighting concepts were drawn up by Robert, and Karice immediately fell in love. Karice has been working with CLO Design for years, and has always loved what they come up with. They are innovators in their own right. To work on this new restaurant location was exciting, and we couldn’t wait to get started. The look and feel of the restaurant has a vintage appeal. We loved it. As you enter into the front door one is greeted by two large starburst style chandeliers. Each light is equipped with vintage edison style LED bulbs. The lights are huge at a 5ft diameter globe shape. 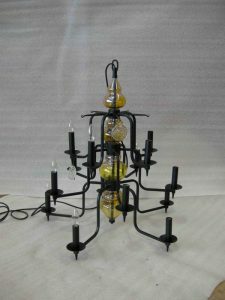 In the dining area two large 5ft diameter chandeliers were made. Each light has (x24) candelabra bulbs. Feit Electric’s new edison LED Bulbs were perfect for the light. Feit has done an amazing job on reproducing the warm glow of the incandescent bulbs. The six booth tables have a steel pendant light that hangs over each location. The steel shades were made with thin gauge mild steel, and were left with a natural steel finish. Each shade was coated with a clear epoxy finish to preserve the look. Each steel pendant is illuminated with a single edison LED bulb. Upstairs in the Growler room is an inviting space for sitting at the bar. Three large rings and custom 8-lamp chandeliers were meticulously installed on the ceiling on the mezzanine level. Stunning artistry. Sophisticated design. Seamless process. That’s the Karice way, and that’s what we do every day. For more information about us or to see how we may collaborate with you or build custom lighting works for you, contact us by sending us an email or calling us at 604-542-7137. In December 2014, Karice was approached by Vancouver Lighting Designer, Hesam Ghaemi to collaborate with him on a new custom lighting installation for the new Earls to be built at Mall Millennia in Orlando, Florida, USA. Hesam had a new idea for custom design pendant lights. Two lighting designs were quoted to Good Animal in February of 2015. Only one of Hesam’s lighting designs was selected by the Earls Design Team to be used in their new project in Orlando. Shortly thereafter, the project was awarded to Good Animal to build fifteen new custom designed pendant lights for the new location in Orlando. Karice was contracted by Good Animal to further design and craft the pendant lights, and to bring Hesam’s vision to life. Karice immediately went to work to prepare the shop drawings for the project. Round four shop drawings were approved by Earls in the fall of 2015. In December, Karice began the process of drafting the mechanical construction drawings. Production began shortly thereafter. Fifteen custom design pendant luminaires were crafted by the team at Karice for the new project. Design challenges included the sloped ceiling that the lights were to be mounted to. An approximate angle was provided by architects. Using this angle Karice designed a two piece canopy that was sloped as well as adjustable. Site conditions are never what they seem, so this was calculated into the design of the custom ceiling canopy. Slight aesthetic design changes did occur along the way. The back metal diffusers were originally black, and were changed to gold. The height of the glass diffusers were modified, to suit the bulb that was eventually selected. Everything had to be perfect for the new project, and perfect it was. The final result was stunning. New Replica Custom lighting design – Vintage lights are recreated with a revised design for the Artizia fashion boutiques across North America. Aritzia approached us to replicate a light fixture they had brought over from Europe. Not only did they want us to reproduce it, they also wanted us to add an additional tier to the light. The original light consisted of two lighting layers, the new light required 3 lighting layers. This affected the overall design of the light. The new light was much taller and wider in shape. Conceptual designs were first drafted in AutoCAD. Once approved, Karice went to work to craft the new light. 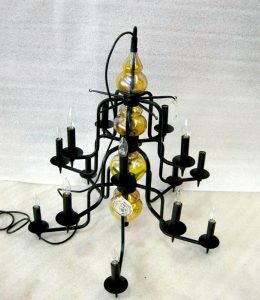 The new light had fifteen candelabra bulbs. Special custom candle holders were created for the chandeliers. 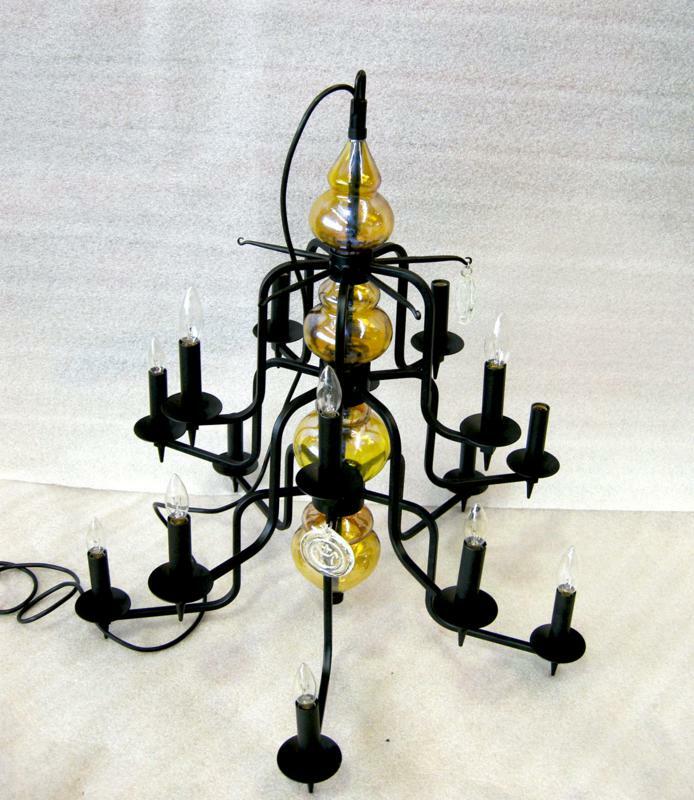 Each candle holder had a custom machined finial that was attached to the underside of the candle cup. The lights were finished in a matte black finish. Once wired up, the lights were UL Certified for the destined homes in various locations in the US chain for this classy clothing store. Challenges along the way included sourcing the material for this project. It required 3/8″ square tubing. This size tubing was not available in Canada. Luckily, we are close to border, and the correct tubing was sourced from a supplier in Seattle, WA. Another challenge in the project was the glass. 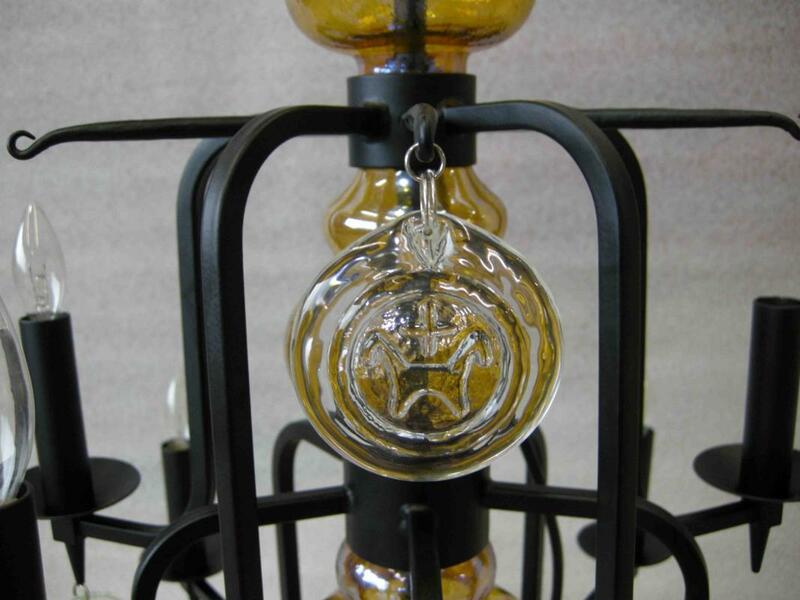 Our glass blower had custom moulds made to achieve the bulbous shapes. This ensured that all lights were made with identical glass for the fourteen lights that were crafted and shipped across Artizia’s North American chain. Glass medallions were also made for this project. Using our CNC milling machine, unique “STAMP” shapes were created so that an impression could be stamped into the hot molten glass. Aritzia was very happy with the finished custom chandelier, which can be seen in many of their retail stores across North America. I wanted to further develop my lighting line with custom refined components. A few discussions over the phone and Karice was able to create what I wanted for my Rope Light – beyond what I expected. The fact we’re on either sides of the continent in different countries wasn’t an issue at all. Working with Karice was a seamless and enjoyable process. Karice has been working with our design team for over twenty years and has been one of our most trusted vendors. We’ve collaborated on many custom lighting projects over the years and Karice successfully handles the whole process, from initial design concept to engineering, final manufacturing and shipping. All content copyright Karice Enterprises Ltd . Karice is a Canadian Lighting Manufacturer located in Surrey, British Columbia Canada. We ship to all of Canada and the USA.